Immigration and Customs Enforcement (ICE) in the first half of 2011 deported 46,686 parents who had at least one U.S. citizen child, says an ICE report made public last Monday. “If deportations continued at that rate for the rest of 2011, we can assume that over 100,000 kids who are U.S. citizens saw parents deported,” said Stacy Martin, vice president for external relations of Lutheran Immigration and Refugee Service (LIRS). “The United States prides itself on being a country that honors and upholds family values, yet the U.S. immigration system is absolutely failing American families,” Martin said. 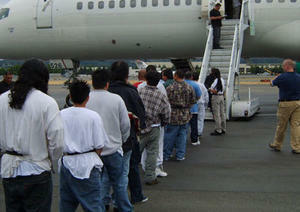 The period covered by the data in the new report by ICE, an agency of the Department of Homeland Security, is 1 January 2011 – 30 June 2011. A LIRS release reports that In January 2012, the Applied Research Center released “Shattered Families,” a report showing that more than 5,100 children of immigrants have ended up in foster care because U.S. immigration authorities had either detained or deported their parents. The report also predicted that at least 15,000 more children would end up in foster care over the next five years. In 2011 ICE issued prosecutorial discretion guidance to U.S. immigration officers and announced a nationwide review of cases pending before immigration courts to determine which cases are considered low-priority for removal. For a parent of a U.S. citizen child to qualify for relief under this guidance, a parent would need to have long-time presence in the United States and have established compelling ties and made compelling contributions to the United States.